Chenille Kraft Papier Mache Heart Box-Photo-4-3/4X4-3/4"X2-3/8"
HyGloss Green Foil Board Shamrock, 6" 10pk. 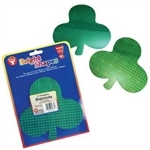 HyGloss Green Holographic Shamrock, 6" 10pk. HyGloss Green Foil shamrock 6" 12pk. HyGloss Green Foil shamrock 6" 24pk. Copyright © Science Purchase. All Rights Reserved.